Applaws Chicken and Salmon Cat Food is a unique complete diet for adult cats. It simulates the natural diet of a cat in the wild in a dry kibble form. Cats are carnivores and their digestive system is adapted to thrive on a diet high in natural animal proteins, so this food contains a very high 80% content of premium chicken and salmon. High animal protein diets are easily accepted and easily digested, in addition to promoting a healthy weight and lean muscle maΒ. The natural cat diet does not contain any grains, as they are difficult for cats to digest. Applaws is 100% grain-free, so it is ideal for cats with nutritional intolerances and allergies. 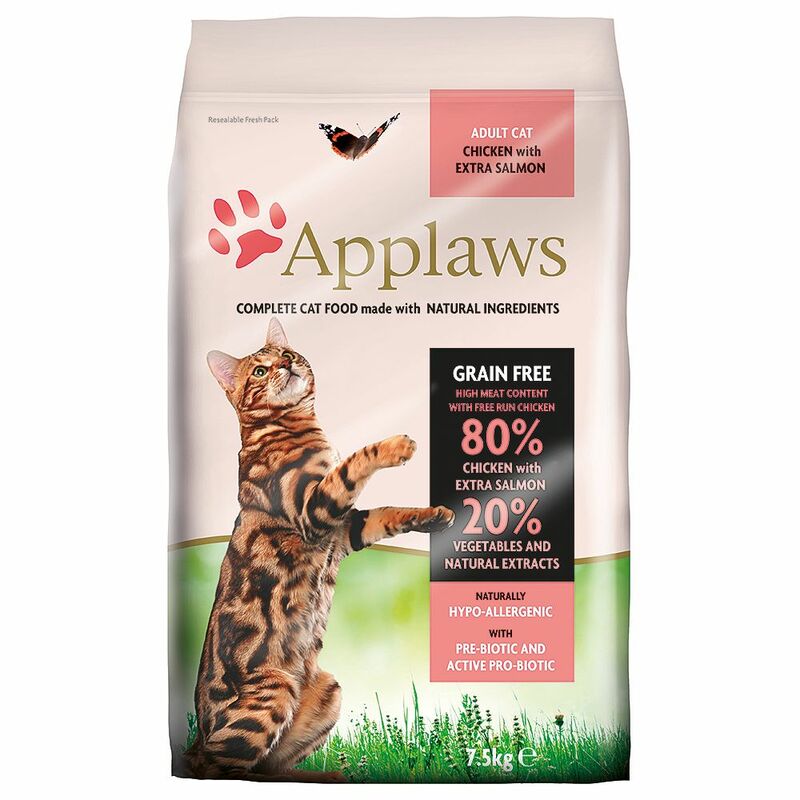 Applaws Chicken and Salmon Cat Food is a premium quality kibble that uses only the best ingredients. Applaws uses only the highest quality animal muscle meat, so this dry food is free from any meat by-products. Additionally, functional ingredients like prebiotics and beet pulp help to support your cat's digestive system. The added salmon oil helps to promote a gloΒy coat, as it is particularly rich in Omega-3 and Omega-6 fatty acids. Applaws dry food contains no artificial preservatives. The added antioxidants, for longer preservation of the food, are derived from natural selenium and natural tocopherol, which can have an additional positive effect on your cat's health and vitality. Applaws Chicken and Salmon Cat Food at a glance: Complete dry food for adult cats Ideal for cats with allergies or intolerances 80% meat and fish content: provides premium animal proteins that can be easily utilised by your cat With salmon: a source of Omega-3 fatty acids, which help to promote a gloΒy coat 20% vegetables and natural extracts: provide valuable fibre, vitamins and minerals 100% grain-free: cats do not find grains easy to digest or metabolise. The results of consuming foods with high grain content can be weight gain, diseases of the liver or pancreas, or diabetes Premium quality ingredients: contains no animal by-products or artificial additives Brewer's yeast extract: helps to metabolise carbohydrates, protein and fat With prebiotics: supports healthy digestion and stimulates the growth of healthy intestinal flora With natural taurine: promotes heart function and good eyesight With yucca schidigera: helps to reduce stool and urine odour and promotes healthy intestinal flora With rosemary extract: contains many different agents to promote the immune system and prevent attack from free radicals.